On January 17, members of the Redlands and University communities gathered to hear Lynn Valbuena, chair of the San Manuel Band of Mission Indians, talk about the past challenges and current endeavors of her tribe. Valbuena has been a member of the San Manuel tribal council for 28 years and is currently serving her second term as chair. "I've been involved in tribal politics for about 40 years," Valbuena said. "At 20 years old I was appointed as the first housing commissioner for my tribe, when we had only about five houses on the reservation." Beginning her talk with a brief history of the San Manuel tribe, Valbuena spoke about the living conditions and inner workings of the reservation community. Her great-great grandfather, Santos Manuel, was the Yuhaviatam tribal leader and led a group of indigenous people from the San Bernardino Mountains into the San Bernardino Valley. Shortly after that journey, the Act for Relief of Mission Indians was passed and the San Manuel Reservation, named after Santos Manuel, was established and recognized as a sovereign nation with the right of self-government. "We never forget who we are or where we came from,” Valbuena said. “That's something that's been instilled in me by my mother and grandmother. In our culture, we still use our native language to greet each other, so I say Haminat to all of you." 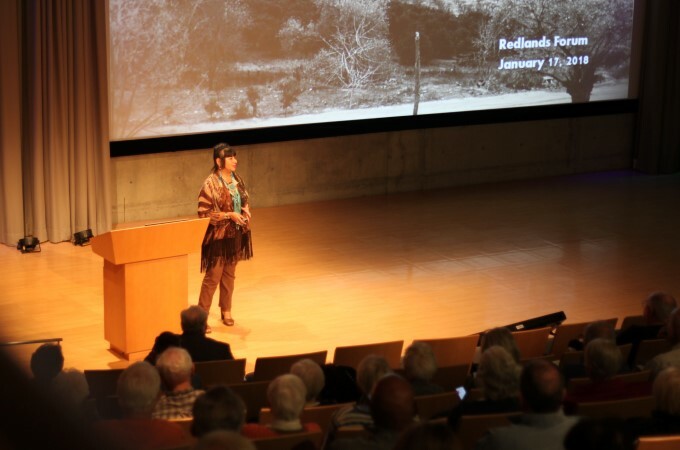 Throughout her presentation, Valbuena shared photographs from her childhood that displayed the orange and apricot groves that existed in Highland, Calif., before the land was sold to housing developers. "Originally, San Manuel's land base was seven million acres, stretching from Los Angeles county and Barstow down to Twentynine Palms,” Valbuena said. “When Spanish settlers came, we were placed in San Bernardino with only 640 acres of land and no infrastructure, which is why it has always been difficult to expand our reservation and build houses for our members." After settling in the San Bernardino foothills, the San Manuel tribal council worked to buy land surrounding the reservation, which was eventually used for the development of the San Manuel Casino. Currently, the San Manuel Band of Mission Indians has 900 tribal government employees and 4,000 casino employees. "It's always important to remind our younger generations what life was like on the reservation, because things weren't always that great," Valbuena said. “It has been a long time coming for our tribe and the work that we do. We recently announced that we are breaking ground on a hotel in July of this year, which is something we've never done before." In closing, Valbuena emphasized the importance of involving the local community in her work. "The San Manuel tribe wants to give back to the community as much as we can," she said. "It's important to us that we continue to interact with community members for years to come." The recent talk was part of the Redlands Forum, which is co-hosted by Esri and the University of Redlands Town and Gown. U of R’s Native Student Programs includes the San Manuel Band of Mission Indians Excellence in Leadership Scholarship, made possible by the generous support of the tribe. Next up in the Redlands Forum series is “Redlands: Why We Came and Why We Stay,” a panel moderated by Jack Dangermond, president of Esri, and Larry Burgess, historian and director emeritus of A. K. Smiley Public Library. Registration, which opens one week prior to the talk, is required. For more information, see the Redlands Forum website.